While climate, energy and water remain top concerns, those issues don't hold the same urgency as they once did for sustainability professionals. That's one of the sobering findings in a report published today by research firm GlobeScan Inc. and think tank and strategy consultancy SustainAbility Ltd. The project partners periodically take the pulse of sustainability professionals in business, government, NGOs and academia on a number of issues. "We've scratched our heads about what's behind the decline," said Jeff Erikson, senior vice president in SustainAbility's office in Washington, D.C. 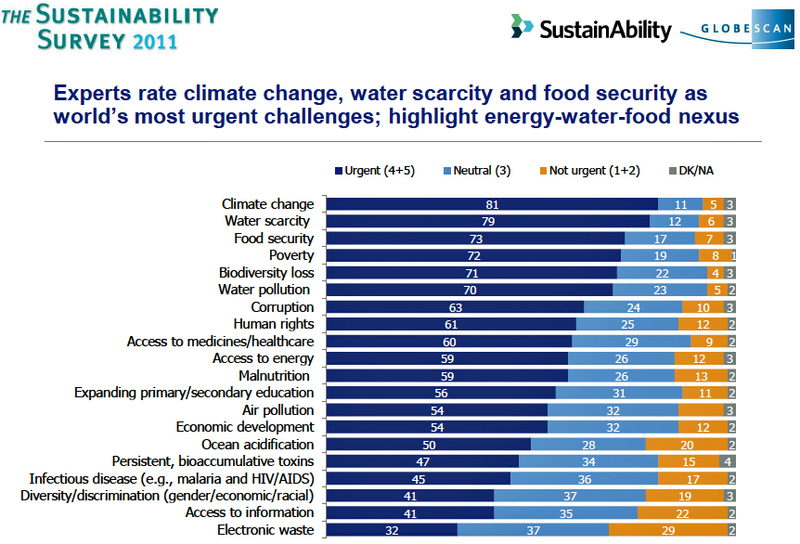 The chart below shows that since 2009, sustainability professionals participating in the survey have considered the problems of climate change, water scarcity, food security, poverty and loss of biodiversity as major global concerns. Yet each year since, the experts have also deemed those issues less urgent. Erikson, Whitaker and GlobeScan Senior Vice President Chris Coulter said the decline is likely to be the combination of several factors, including acceptance of the issues or simply familiarity with them; the lingering poor economy; the persistent lack of political will among government leaders to act on issues; and the overwhelming nature of the problems. It's possible, Erikson said, that the concerns have become "accepted as the new normal ... and the perceived of the landscape of the future." "My take is the drop was more significant between 2009 and 2010 and less so between 2010 and 2011," Coulter said. "I think that Cop15 in Copenhagen was a significant blow to these folks. There was such an emotional connection and buildup [to the climate talks]. That brings us to Rio +20. 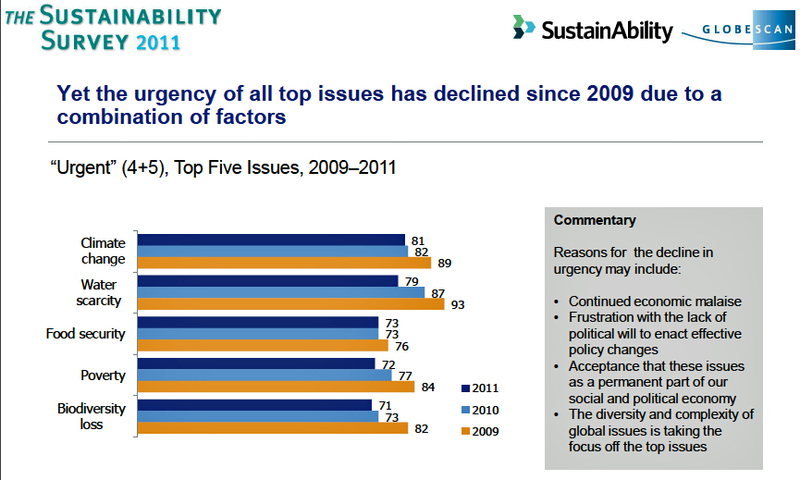 What does this [sustainability professionals' view on urgency] mean for that event? Where do their expectations come in?" Food security was the third most pressing issue on the global front, but food issues of scarcity and quality claimed the 14th spot in a 17-item list of anticipated challenges in respondents' countries. The anticipated in-country challenges likely reflect where the respondents live and the level of economic development of in their countries. 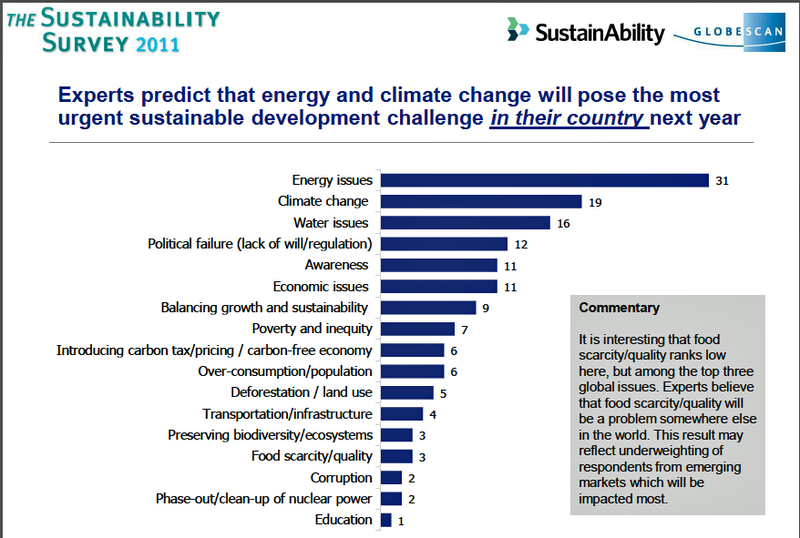 Most of the participating sustainability professionals are from North America or Europe. For example, respondents in developed and emerging markets also differed in selecting the top two challenges for their regions. North Americans and Europeans say energy and climate are the No. 1 and No. 2 issues that will confront their areas. Respondents from emerging markets in Asia, Africa, the Middle East, Latin America and Caribbean said energy and water would be the most important. Another telling point in the study is that the gap is growing between perceived sustainability needs and industry performance on environmental issues. 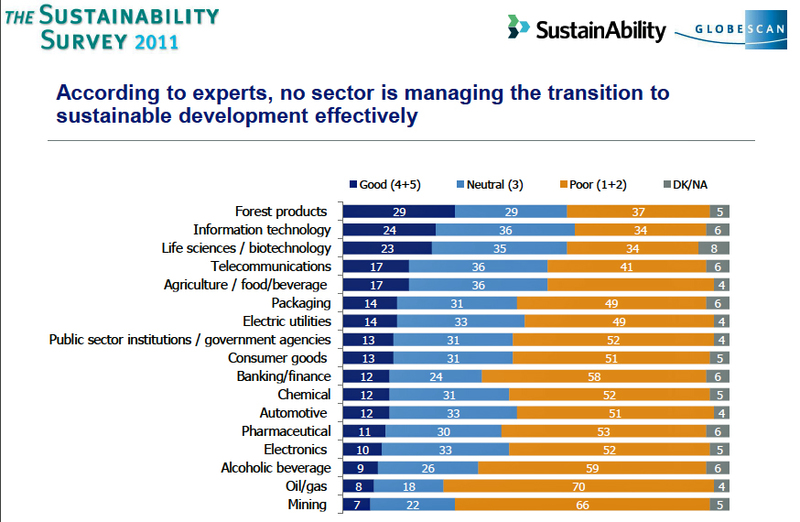 Not one industry in 17 was considered to be doing well in moving toward sustainable development. "For companies to thrive, they need to take much bolder action than they have been," Erikson said. "This is not just a societal risk, but also a business risk. Companies should be taking an integrated, if not holistic, approach. Image CC licensed by Flickr user woodleywonderworks.